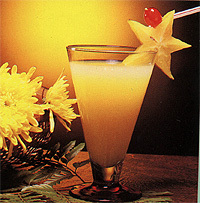 2.Garnish with Star fruit (slice) and Red Cherry. 1.Cream (A) ingredients together in a machine. 2.Add (B) melt in pan, add (C) to above mixture. 3.Fold in (D) and pour mixture into 24cm ring which has been lined with sweet paste and sponge. 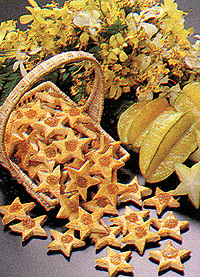 Chill in chiller till set, decorate with Star fruit serve cool. Cook Filling and reduce till 1/3 amount. 1.Whip the butter, egg yolk and ice water till creamy. 2.Add sifted items and mix to form a dough. 4.Roll the dough 1/2 cm thick and cut with a star shape cutter. Press your finger in the middle after placing them on baking sheet. 6.Reduce the Starfruit filling till 1/3. 7.Pipe some filling in the middle and bake at 190oC for 10 to 15 minutes.